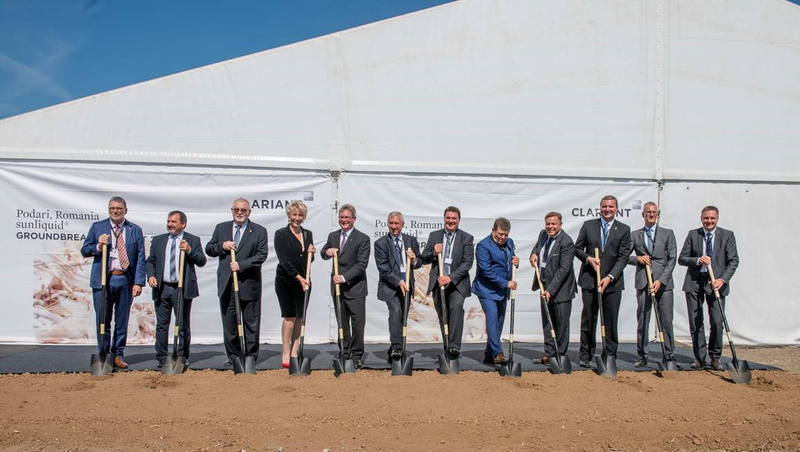 Muttenz, September 12, 2018 – Clariant, a world leader in specialty chemicals, today officially started construction of the first large-scale commercial sunliquid plant for the production of cellulosic ethanol made from agricultural residues. At the flagship facility, the sunliquid technology developed by the company is being used on an industrial scale for the first time. 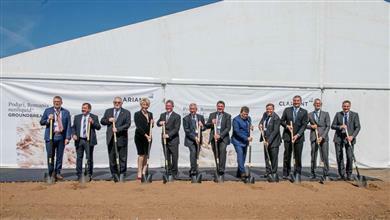 The occasion was marked with a traditional groundbreaking ceremony in Podari near Craiova in southwestern Romania, which was attended by official representatives of the Romanian government, the Swiss Ambassador Urs Herren, and a Clariant representation headed by Christian Kohlpaintner, Member of the Executive Committee. The realization of the plant represents the biggest industrial commitment by an international corporation in this region[i]. At full capacity, the plant will process around 250 000 tons of wheat and other cereal straw sourced from local farmers to 50 000 tons of cellulosic ethanol annually. By-products from the process will be used for the generation of renewable energy with the goal of making the plant independent from fossil energy sources. The resulting cellulosic ethanol is therefore an advanced biofuel that is practically carbon-neutral. The decision in favor of Craiova was due partly to the existence of a secure regional supply of feedstock and partly to the region’s existing logistic and industrial infrastructure. Construction of the plant will provide a whole range of benefits for the surrounding region of Craiova. It will allow local farmers to industrially market straw for the first time, which was previously practically unutilized agricultural residue. During the construction phase of the new plant, several hundred construction workers will be employed from locally based companies wherever possible. sunliquid® IS A TRADEMARK OF CLARIANT REGISTERED IN MANY COUNTRIES. [i] The project receives funding from the European Union's Seventh Framework Program for research, technological development and demonstration under Grant Agreement no. 322386 (FP7 SUNLIQUID) and from the Bio-Based Industries Joint Undertaking under the European Union's Horizon 2020 research and innovation program under Grant Agreement no. 709606 (BBI LIGNOFLAG). Groundbreaking ceremony for the new sunliquid plant in Craiova/Romania (from left to right): Urs Herren, Ambassador of Swiss Confederation, Claudiu Mares, State Secretary at the Ministry of Agriculture, Anton Anton, Minister of Energy, Paula Pîrvănescu, State Secretary at the Ministry of Business Environment, Commerce and Entrepreneurship, Christian Kohlpaintner, Member of the Executive Committee Clariant, Ion Prioteasa, Dolj County Council President, Philippe Mengal, Executive Director BBI JU, Constantin Gheorghita, Mayor of Podari, Oliver Kinkel, Head of Region Europe Clariant, Dragos Gavriluta, Clariant Project Director sunliquid Romania, Markus Rarbach, Head of Business Line Biofuels & Derivatives, Clariant, Martin Vollmer, Chief Technology Officer Clariant.